Hampton Inn Mission Valley will be constructed on a previously developed site that includes walking trails, trailhead, protected habitat areas and existing specimen trees. The landscape architectural site design was created with sensitivity to all the existing features while providing an aesthetically appealing, environmentally appropriate setting for the hotel guests. The design was executed in compliance with the Hampton Inn branding standards. The main site feature of the project is an outdoor lounge area which includes a custom fire feature, seat & feature walls, elegant garden space and swimming pool and spa. 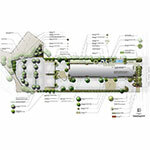 Other aspects of the site include a parking lot planted with native vegetation, landscape lighting, a series of ramps for ADA access, and decorative enhanced paving.